Mario Susko is retelling the oldest tales of brutality and human unkindness with unmediated honesty. There is in the modest catalogue of possessions in these poems a kind of epic finality–this is how we were if an archeologist asks… This is a work of delicacy and brutal fact, of poetic preciseness and logic, and, at the same time, of illogic and absurdity. It is an elegy, a requiem, and yet it is always about life, living and the things of existence. We deal here with the agon of remembrance and oblivion, which is also the struggle of life and death, i.e., the struggle for life where death is the act of final perception. We have before us an author of truly sophisticated and epochal consciousness. Born in Sarajevo, Mario Susko is a witness and survivor of the war in Bosnia. Wounded during a mortar attack, he left the city in March of 1993 and came to the US that November. He graduated in English from the University of Sarajevo and received his M.A. and Ph.D. from SUNY at Stony Brook in the 70s. Between 1970 and 1990 he edited and translated poetry by Theodore Roethke, e. e. cummings, fiction by Donald Barthelme and Saul Bellow; also, he translated fiction by Bernard Malamud, James Baldwin, E. L. Doctorow, James Dickey, William Styron, and Kurt Vonnegut, among others. He has published nineteen books of poems, two of them in the US, Mothers, Shoes and Other Mortal Songs and Versus Exsul, where he has lived half of his past thirty years. He has also edited and translated into Croatian Black on White, an anthology of 20th century African-American poetry, as well as the integral edition/translation of Walt Whitman’s Leaves of Grass, both released by Meandar in Zagreb (2000 & 2002). 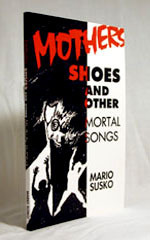 He is the recipient of several awards, including the Nassau Review Poetry Award, the “Nuove Lettere” International Prize for Poetry and Literature for Mothers, Shoes and Other Mortal Songs (I. C. I. in Napoli, Italy, published the Italian edition of the book in 2001), and the Tin Ujevic Award (Croatia) for Versus Exsul.